This is how a wedding is transformed into a work of art. Not many people can say they are the subjects of a work of art. 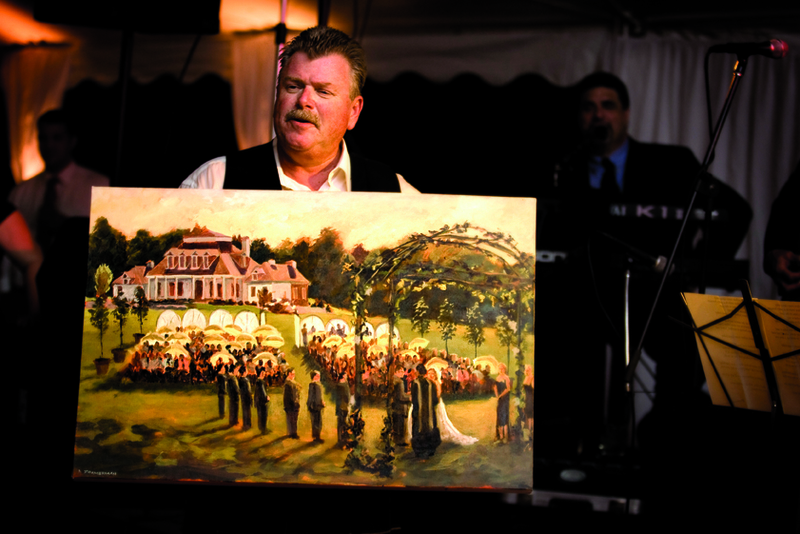 But that will change for any couple who invites a live event painter to their wedding. 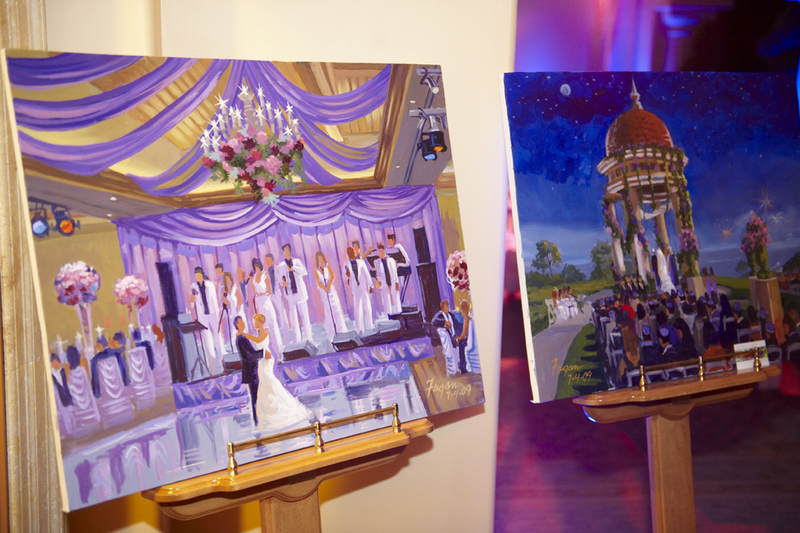 Live event painters are professional artists who paint portraits of weddings during the actual event. 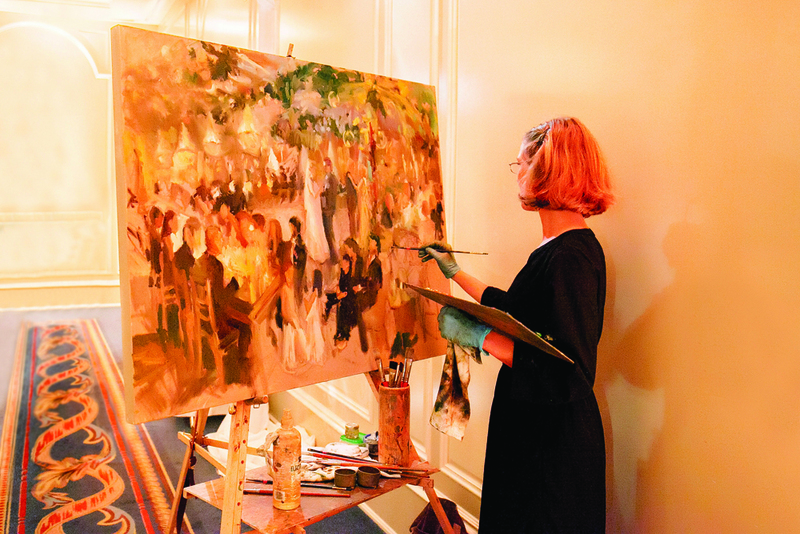 They bring their canvas and supplies, set up at the celebration, and paint a scene that includes the newlyweds, their guests, the venue, and the décor. The painting is presented to the newlyweds after the big day, giving them a gorgeous keepsake that captures the magic and atmosphere of their wedding. Couples can visit live event painters' websites to get a sense of their style; then, they are encouraged to meet with the artist to see their work up close and discuss their wedding. They may request certain guests and design details that they want to be included in the painting. On the day of the event, the painter will arrive a few hours early to set up their canvas and begin painting. 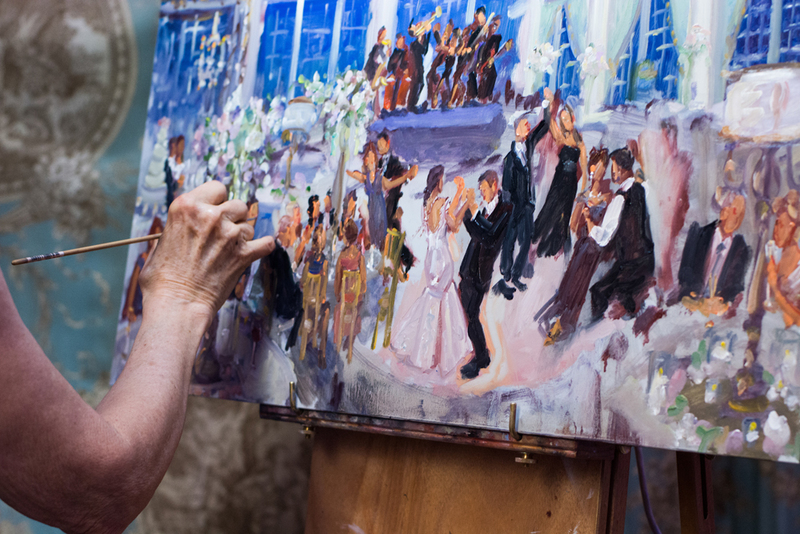 They will continue to work on the painting throughout the wedding, in full view of guests, adding layers of detail that capture the spirit of the celebration. Depending on the artist's process, the finished product may be ready to take home the following day or within a few weeks as the artist adds the finishing touches. Artists' prices vary, but you can expect to spend at least $1,000 per painting. Academy-trained artist Joan Zylkin, from Philadelphia, says she believes she was the first to do live event paintings. She was painting on the street in Philadelphia about 15 years ago when a man approached her and asked her to paint at his wedding. "At the time, I didn’t even know what to call myself or how to get people to understand what I did because it didn’t make sense to them when I told them I could capture the event in one evening," Zylkin remembers. Now she gets clients primarily through referrals and is always "the talk of the evening and beyond." "Guests are always, always gobsmacked when they see me paint," she says (that's her in the photo above!). Each of her paintings is utterly unique, and includes meaningful details tailored to the bride and groom. At the wedding of a woman whose father was a firefighter killed on 9/11, Zylkin painted the bride as a little girl with her father, as well as fireboats speeding past Manhattan's Liberty Tower, which was in view of the venue. Another painting required her to capture a 13-piece mariachi band, Andy Warhol-style images on the walls, and "every rose in Texas." Conditions aren't always ideal – at one wedding, she was forced to finish her painting by holding her iPhone's flashlight in one hand and her paintbrush in the other due to a power outage at the venue. But for newlyweds, the sweat and tears are worth it. Couples who commission a live painting are receiving something more than a photograph; after all, the image doesn't represent exactly what the eye can see, but rather the emotion of the big day. "I am able to do something that cameras and videos can’t do. I can capture the images I want and put them together in one composition, so that they look as though they are all happening at the same time," Zylkin explains. "I want to take the client right back to how they felt that day every time they look at the painting, and to capture the most important details and planning that went into it." See examples of live artists' work below!